Solid-State Drive also known as SSD is new PC storage in last 3 years. It owns linear transfer performance and super-fast seek time. The performance is leading HDD obviously. Some users also cannot be used to HDD speed after using SSD for a while. Comparing to 100/80 MB/s old type SSD and 100/100 MB/s HDD booting and opening file, the SSD is still much faster. SSD performance isn’t like HDD unstable dues to inner and outer gaps. Also, SSD seek time is very fast. These 2 points make SSD performance is much faster than HDD. 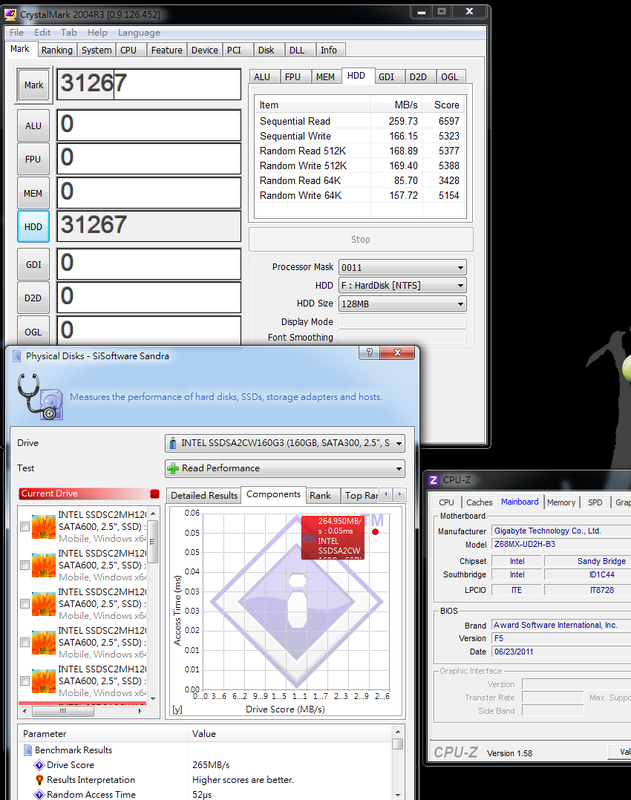 As SSD performance development roadmap, it’s been stuck at 300MB/s for a period.It may cause by SATA2 bandwidth. 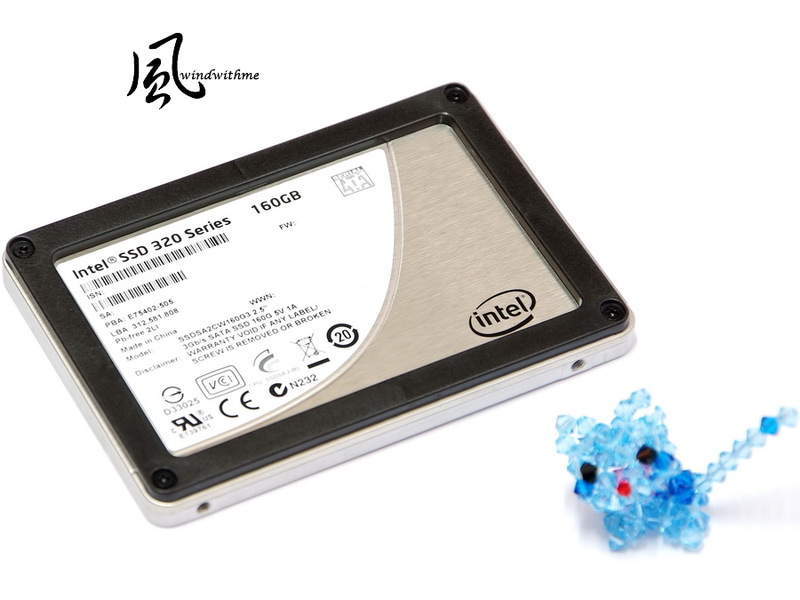 Since SATA3 becomes popular and Intel chipset support natively, the SSD which is over 300MB/s started to sell since last year. Till this year, you even can see many 400~500 MB/s high speed SSD. The SSD products segment and price are decided by capacity and performance. Intel enters SSD business for long time. 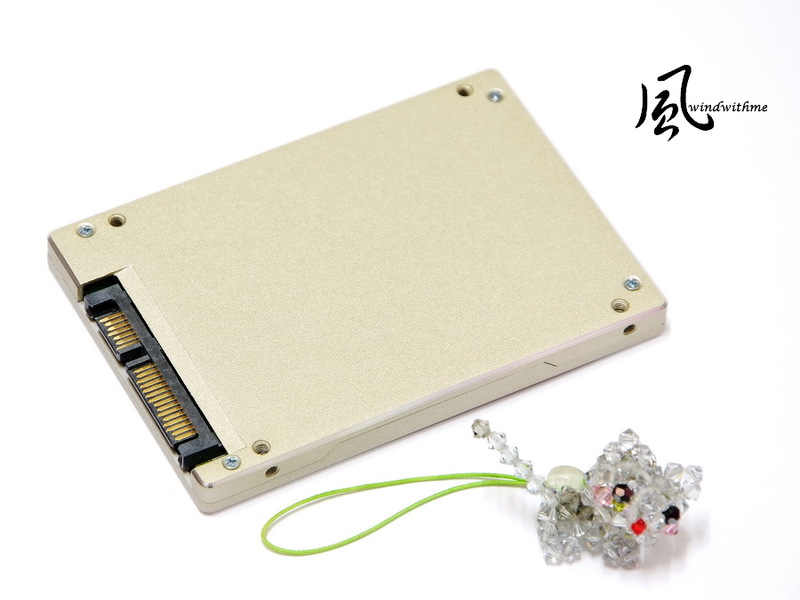 It owns own R&D ability for NAND Flash and controller chipset. Previous 2.5” version it uses X25-E/X25-M to distinguish SLC and MLC. After that, it launched MLC entry model, X25-V.
SLC structure is better; however, the cost is too high. That’s why you see less and less SLC SSD in the market. In naming, these 2 new SSD product lines change to 320 and 510. First, let’s start with 320 SERIES 160GB. 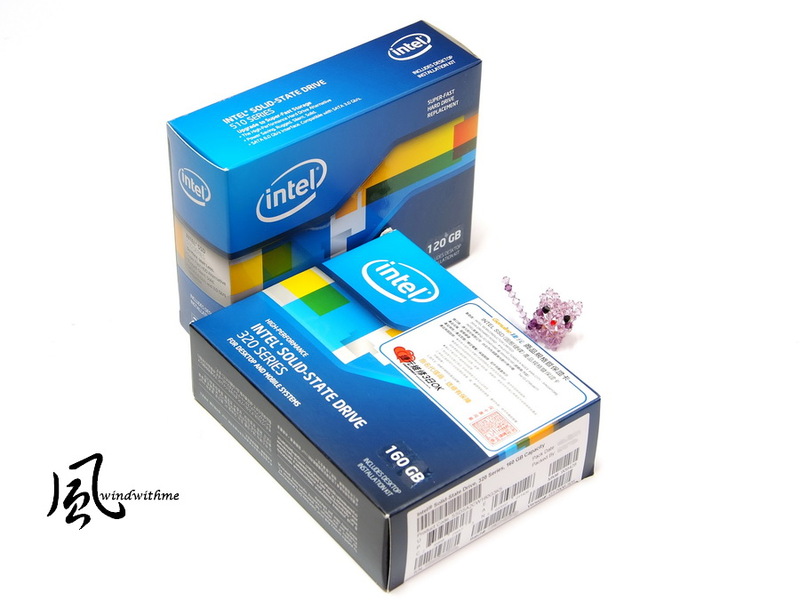 The packing is same as new CPU which all with Intel new logo. Of course, blue is Intel color. The warranty increase to 5 years from 3. It’s good news for users. 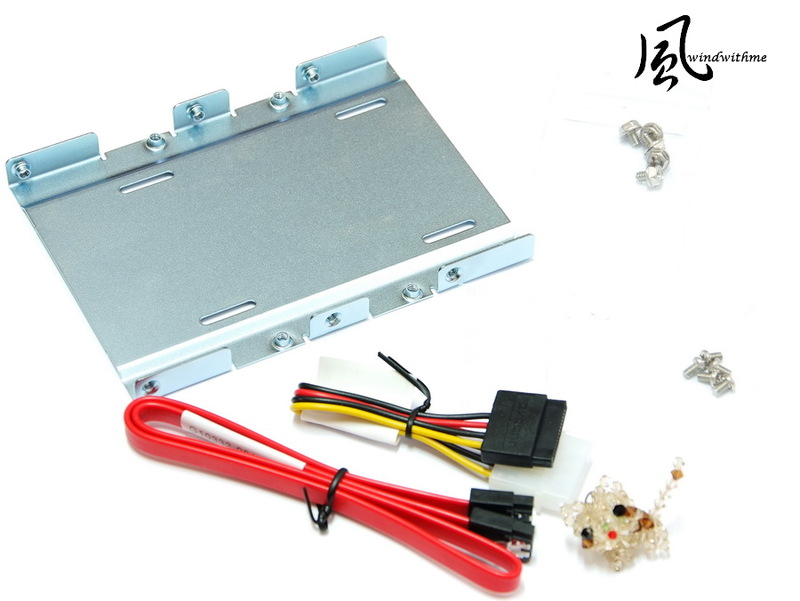 2.5” to 3.5” bay mounting bracket, screws, 4-Pin to SATA power cable and SATA cable. The outlook is same as G2 34nm X25-M. 320 capacity is 40~600GB which is much bigger than previous version. MLC NAND FLASH is 29F16B08CCMEI, total 12 chips and cache buffer is 64MB. 320 series is 25nm and model change to G3. The max capacity is 600GB. 160GB official spec is reading 270 MB/s and writing 165 MB/s. 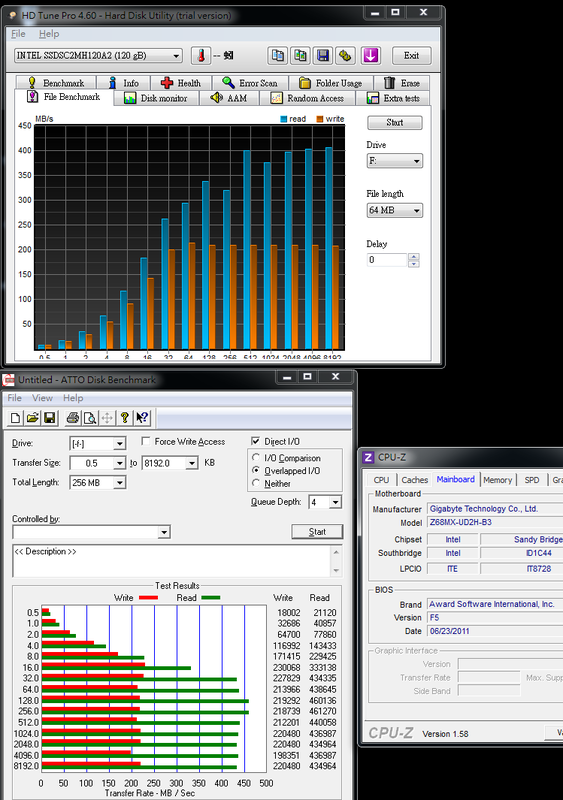 4K reading is 39000 IOPS and 4K writing is 21000 IOPS. As SSD capacity is getting bigger, the performance is also improved. Backside is metal texture. If it has polishing, the quality will be better. Upper-Right golden finger is SATA and power connector. 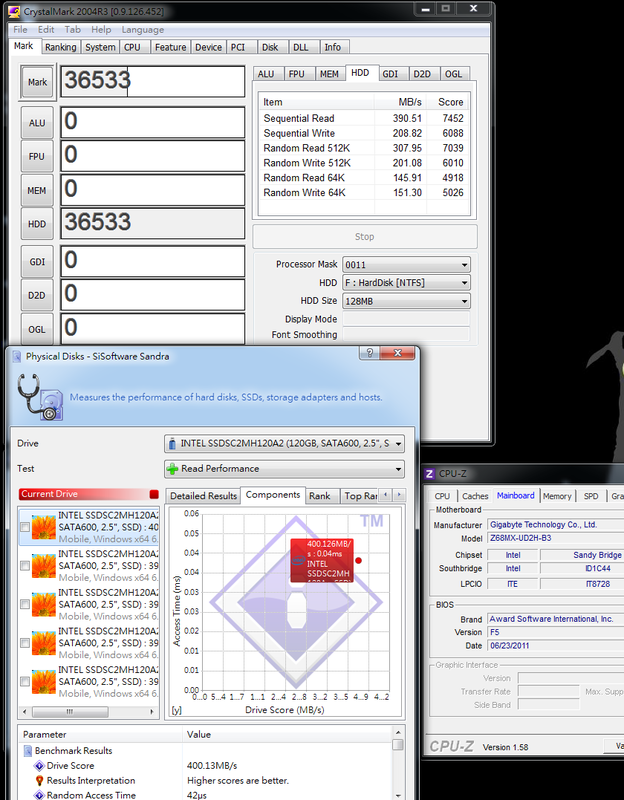 It supports SATA2 which is reasonable for 320 SERIES performance. Another model is 510 SERIES which has 120GB and 250GB. 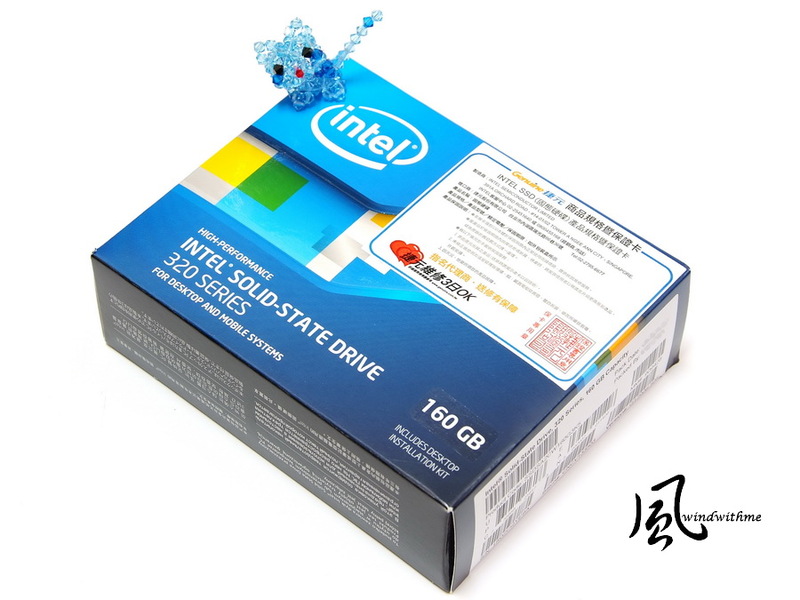 The shell is different with Intel other SSD product. The controller IC is 0Marvell 88SS9174. 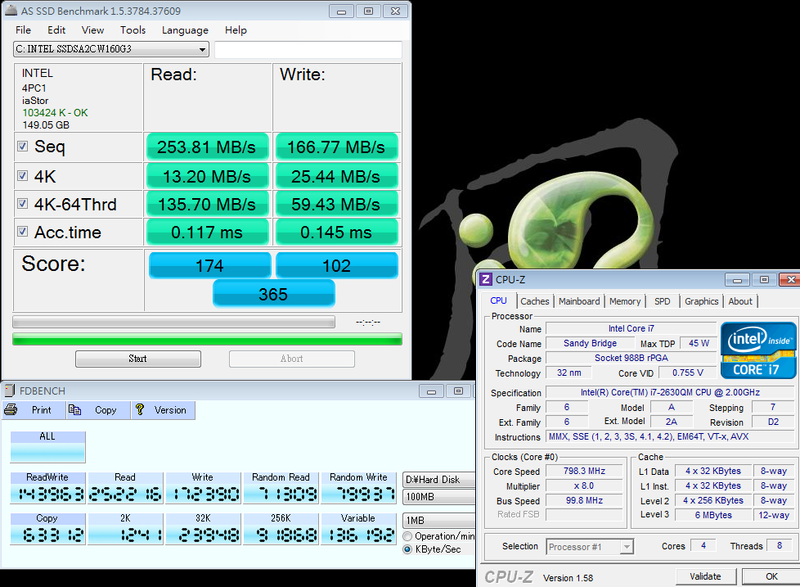 MLC NAND FLASH is 29F64G08CAMDD, total 16 ICs, and cache buffer is 128MB. The accessories are same as 320 series. 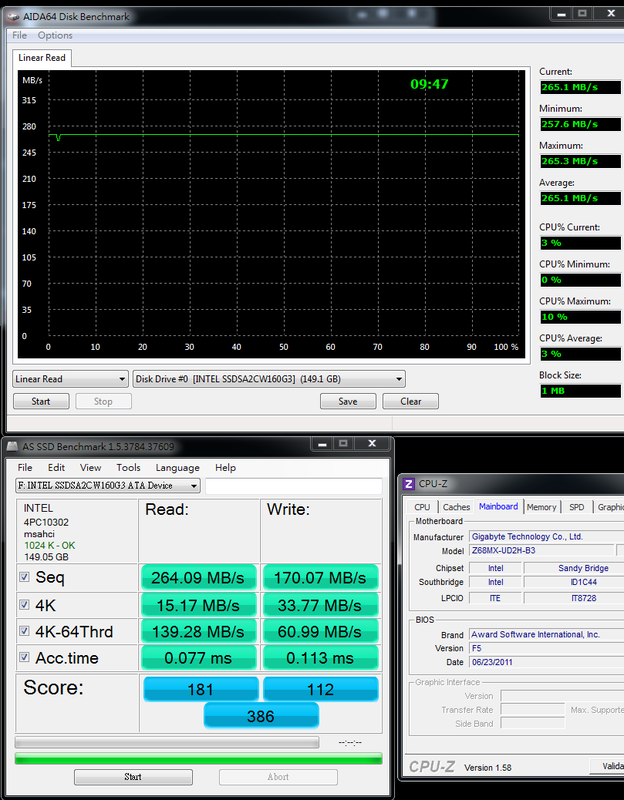 The only difference is 510 using black SATA cable. Official warranty is 3 years, which is different with 320SERIES. I hope it can extend to 5 years in the future. Backside and front side are the same. Lower-Left is SATA and power connector. It supports SATA3. 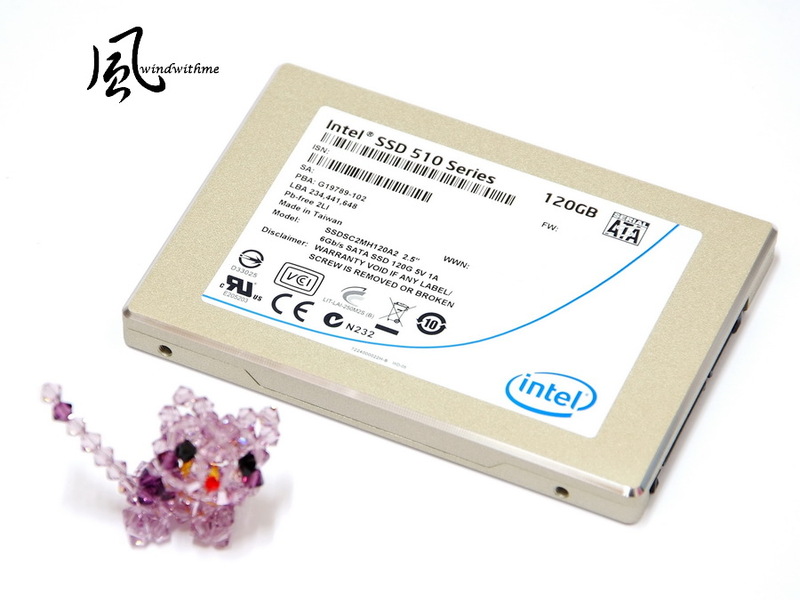 510 120GB official spec, SATA2/SATA3 reading are 265/450 MB/s and writing are 200/210 MB/s. 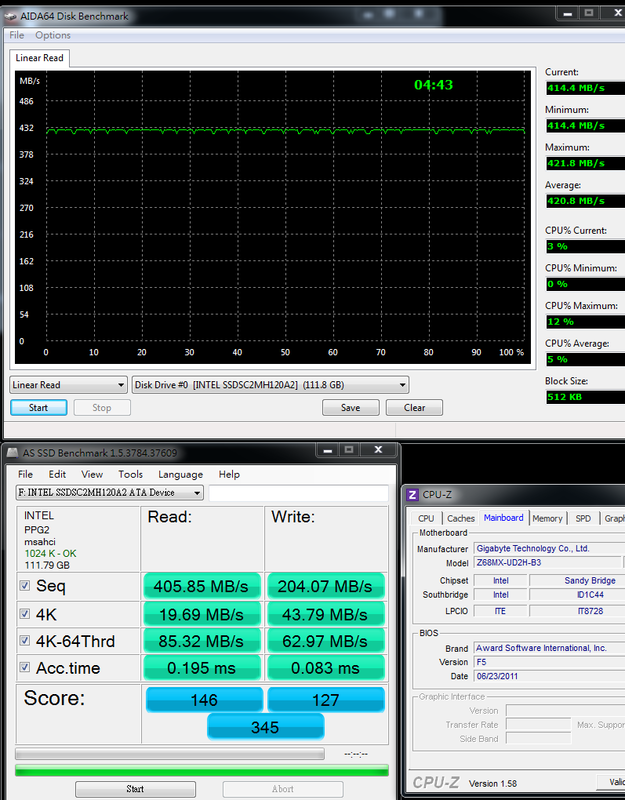 4K reading is 38000 IOPS and 4K writing is 14000 IOPS. 510 SSD bigger capacities have better performance. 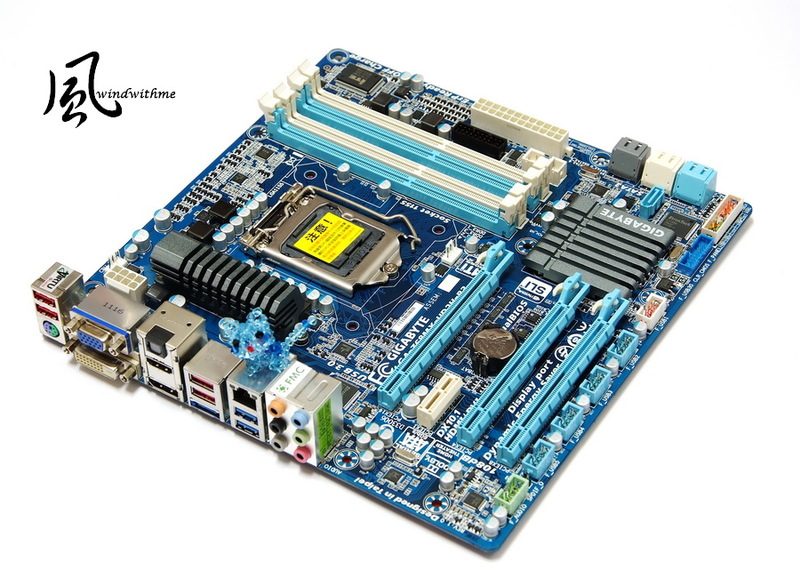 Desktop PC platform uses GIGABYTE Z68MX-UD2H. 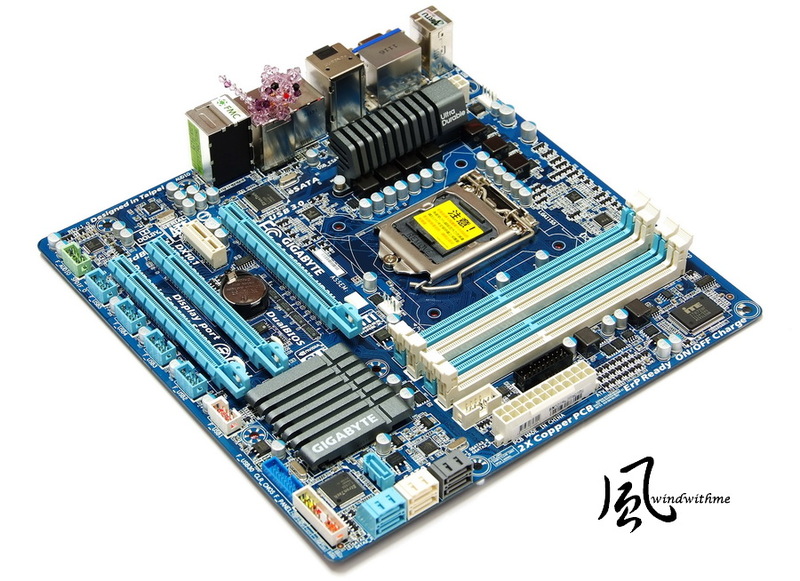 Z68 is Intel latest Sandy Bridge chipset. I use it to test SATA performance. Z68 owns P67 OC and H67 built-in GPU simultaneously. 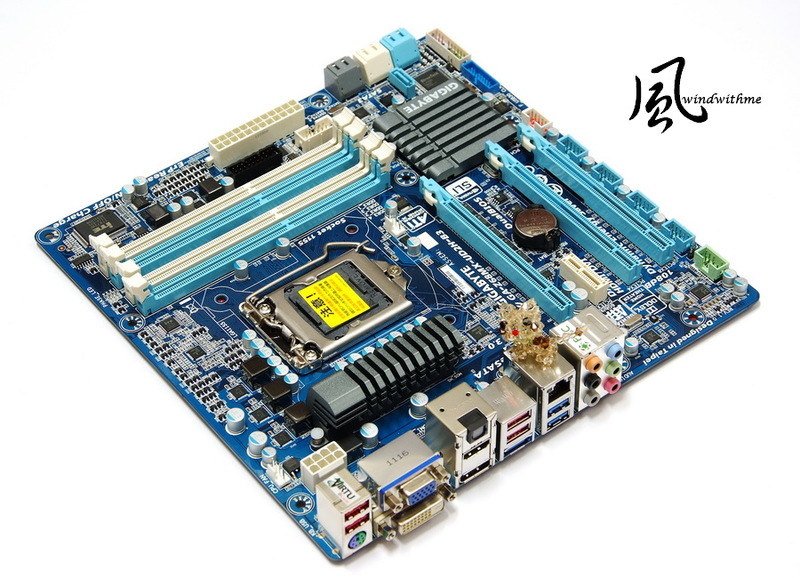 Chipset native support SATA3 and all MB makers use other chip to support USB3.0 and other latest technology. 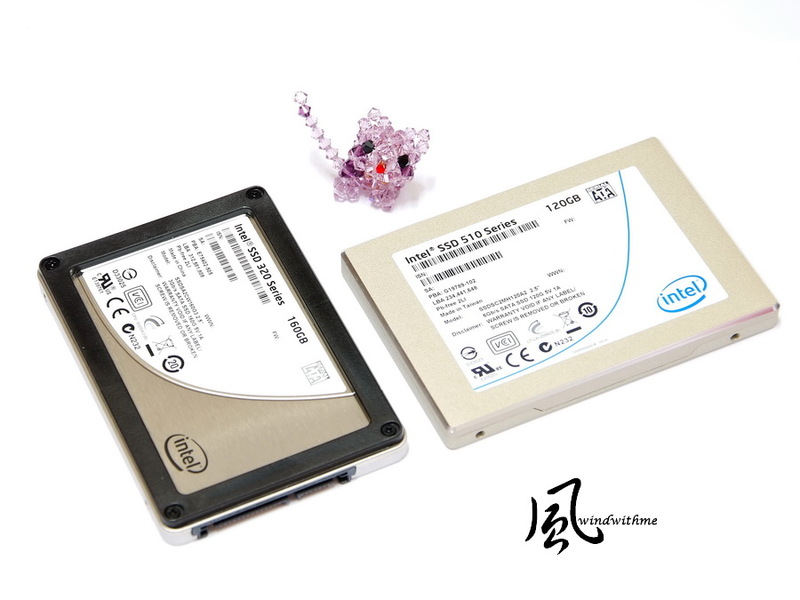 Z68 exclusive support Intel Smart Response Technology which provide hybrid mode of small capacity SSD and HDD acceleration feature. GIGABYTE even provides more convenient EZ Smart Response for users enable SRT as HDD is under AHCI or IDE mode. User doesn’t need to set BIOS as RAID mode and reinstall OS. It save lots of time. Intel 320 SERIES 160GB installs at blue SATA2. 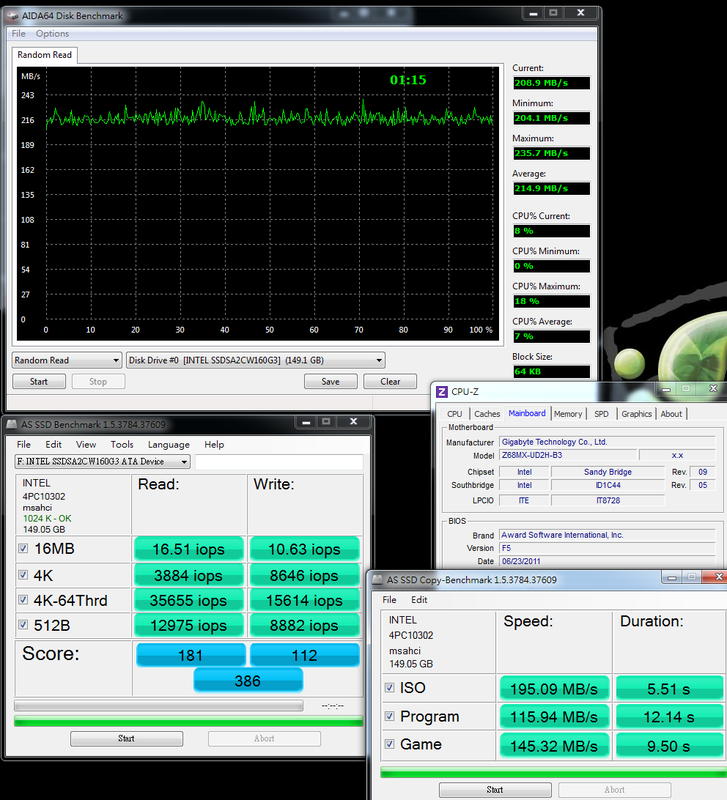 Non OS system drive without data, model is SSDSA2CW160G3, test performance at PC platform. File Benchmark over 512k test is above 250 MB/s. 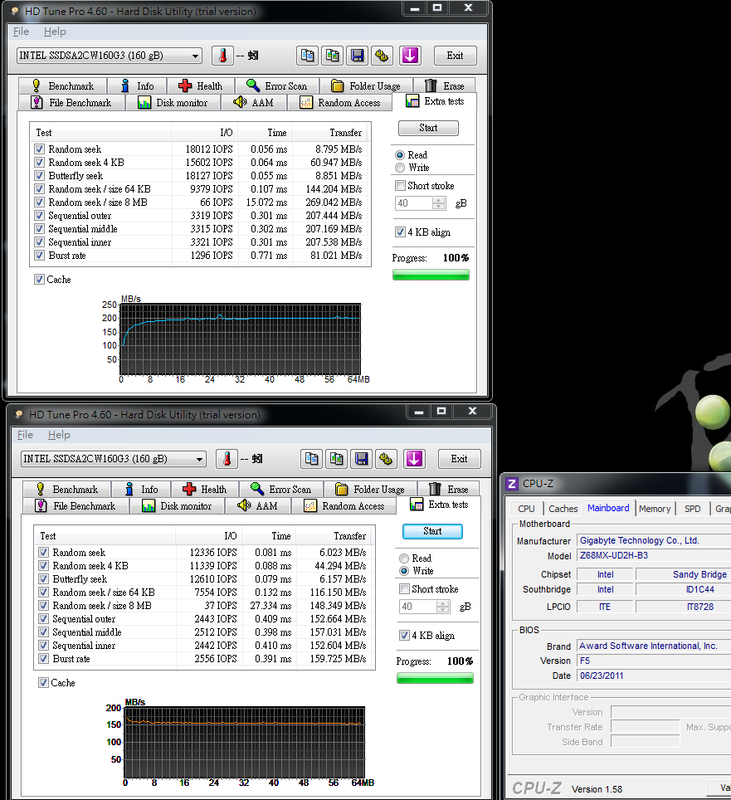 ATTO DISK Benchmark over 32k test get max reading 282.4 Mb/s and writing 175.8 MB/s. 320 SERIES is not high-end performance SSD. 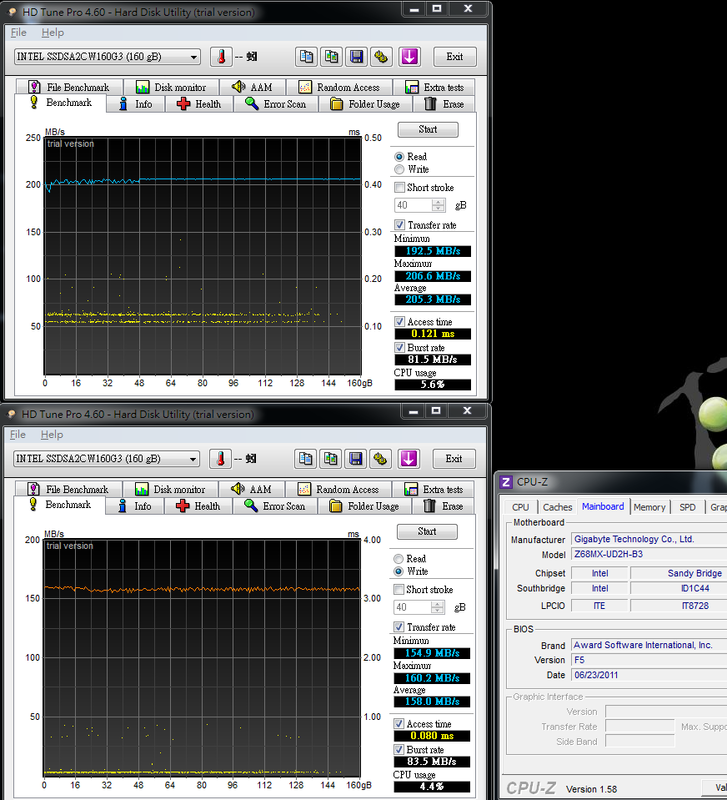 However, most HD Tune Pro test has quite good performance. 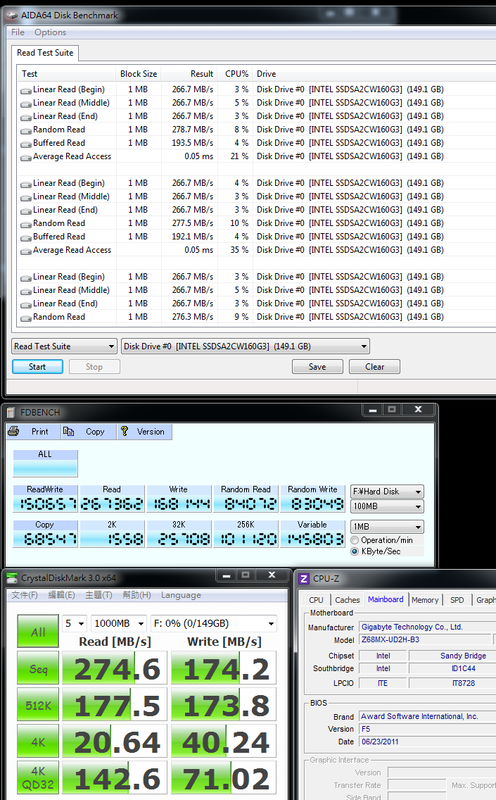 Especially the writing performance, it’s over 60% improvement comparing previous X25-M G2 which is only 70~100 MB/s. 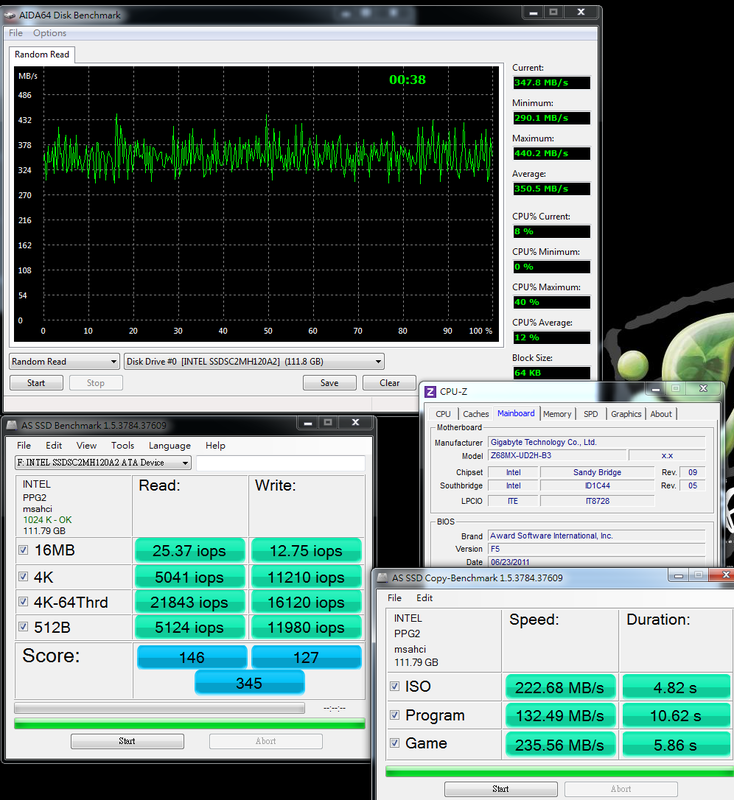 ATTO DISK Benchmark max read/write performance is 280/175 MB/s. This is over official spec. AS SSD Benchmark 4K-64Thrd test result is big gap with official spec. I have been test over 10 times but same result. I think it should be software and drive has compatibility issue. 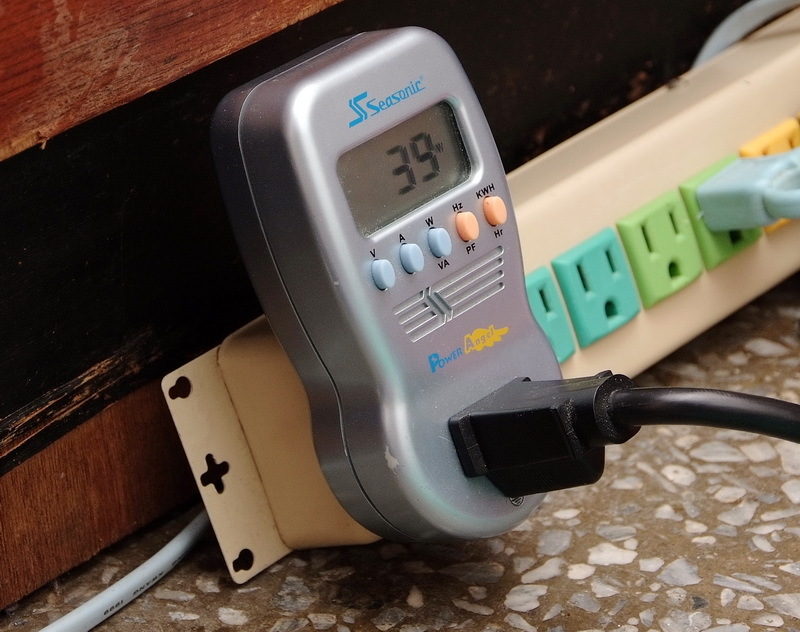 320 SERIES has stable performance with most benchmark software. 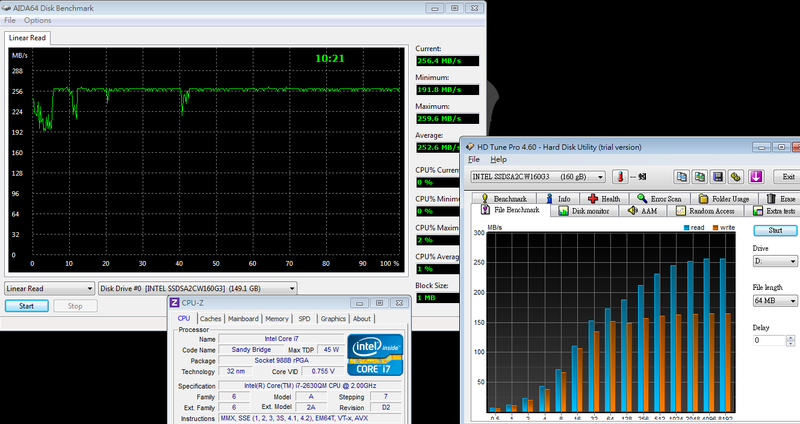 270/165 MB/s spec and 4K performance is still Intel SSD strength. It’s middle range above performance in current SSD market. You can treat 320 SERIES as X25-M G2 enhance version. The reading performance is similar, but writing and manufacturing are enhanced. Intel 510 SERIES 120GB installs at white SATA3. 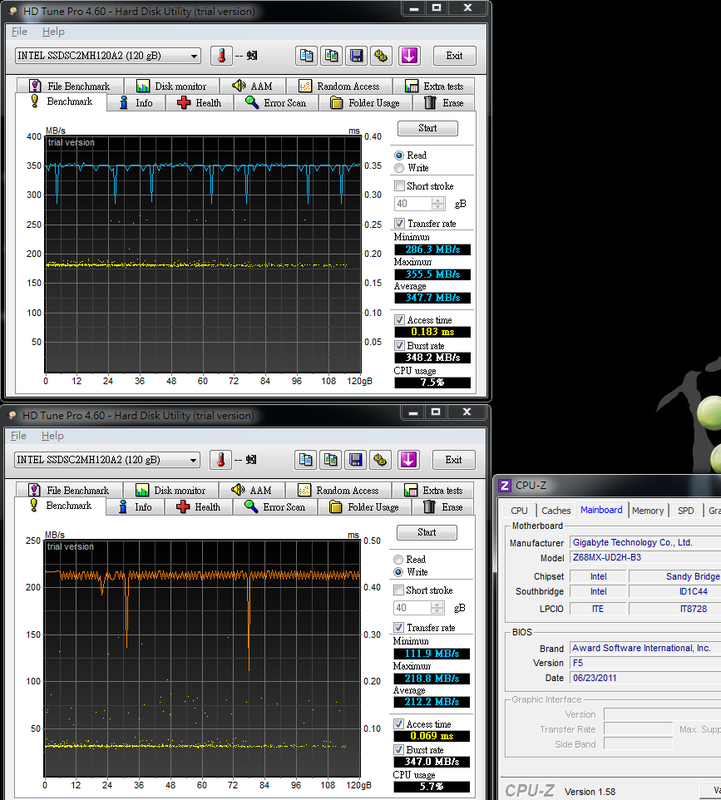 Non OS system drive without data, model is SSDSC2MH120A2, test performance at PC platform. File Benchmark over 512k test is over 400 MB/s. 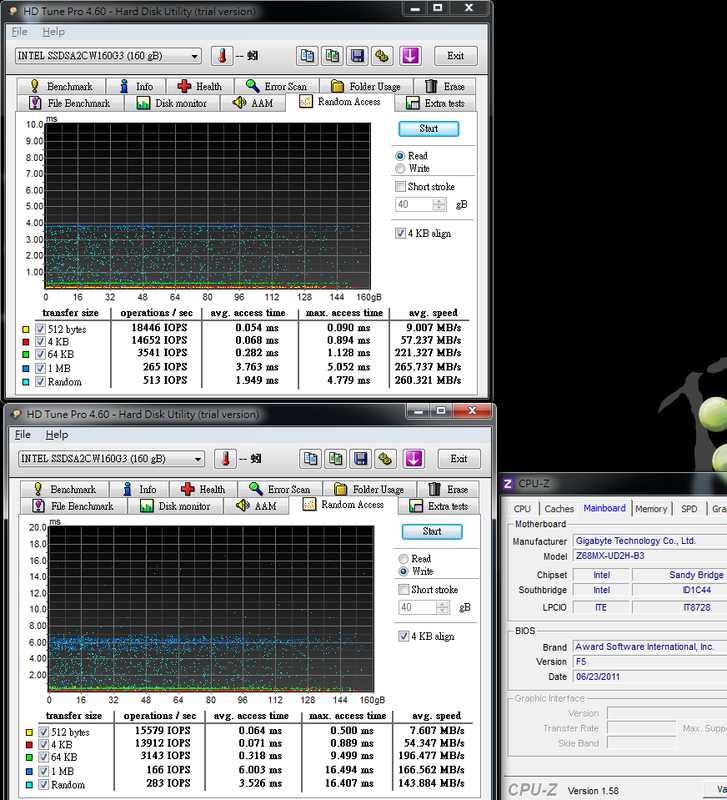 ATTO DISK Benchmark over 32k test is achieving max reading 461.2 Mb/s and writing 230.0 MB/s. 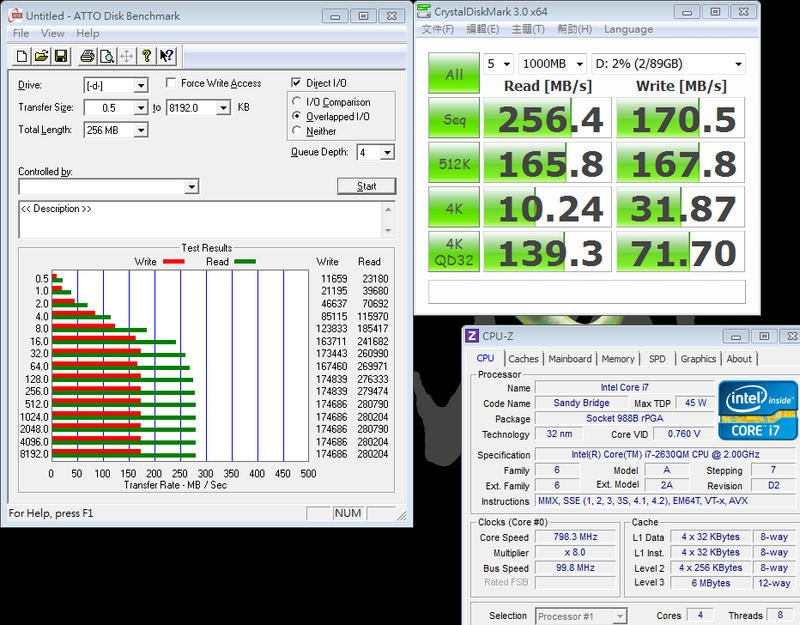 HD Tune Pro Benchmark SSD test result is always lower in my experience. It might be caused by the software. File Benchmark and ATTO File Benchmark can achieve 510 SERIES highest performance. 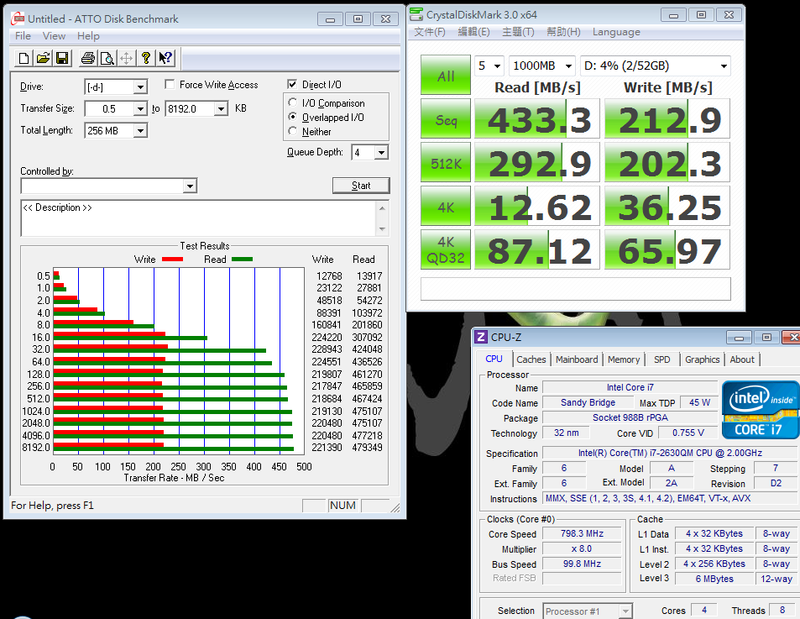 Basically, reading is over 400~500 MB/s and writing is over 200 MB/s are grouping as high-end SSD. FDEBENCH test is reading 385.6 Mb/s and writing 204.8 MB/s. CrystalDiskMark test is reading 442.0 Mb/s and writing 214.1 MB/s. 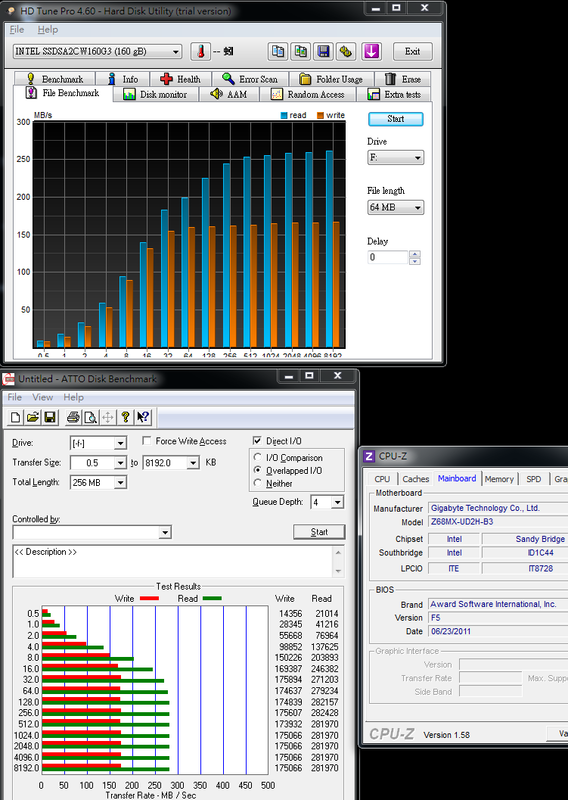 Controller IC is always key factor of SSD performance. 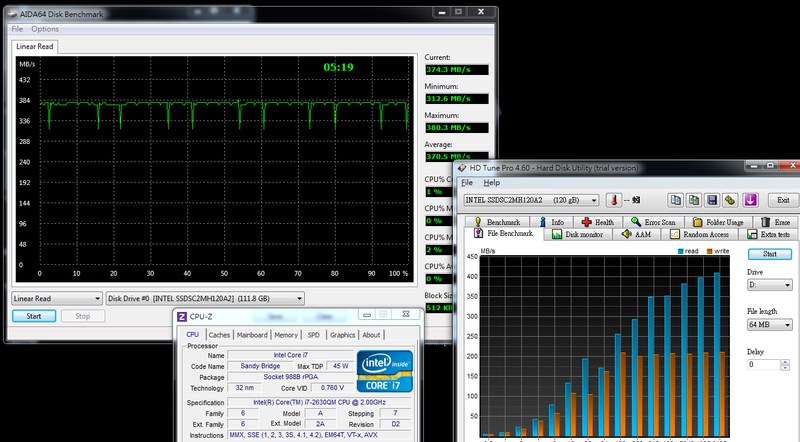 This is the first time Intel use Marvell 88SS9174. The reading performance is excellent. The highest performance in PC is 461.2 Mb/s. Even though Intel 4k performance is always in leading position, 510 doesn’t have any big surprise. I hope there is a new product can break through the 4K performance. Enter to OS desktop for 3 minutes and take the lowest Watt. 2.5” WD 320GB is the OS drive. WD 320GB is the OS drive and add 320 160GB SSD. Most time, it’s 39W and less to 40W. WD 320GB is the OS drive and add 510 120GB SSD. 320 160GB SSD is the OS drive add 320GB HDD, it’s still at 39W. For power consumption, no matter if there is SSD, it only increase 1~2W. Comparing to platform with both HDD and SSD, HDD power consumption is little bit higher than SSD but not big gap. 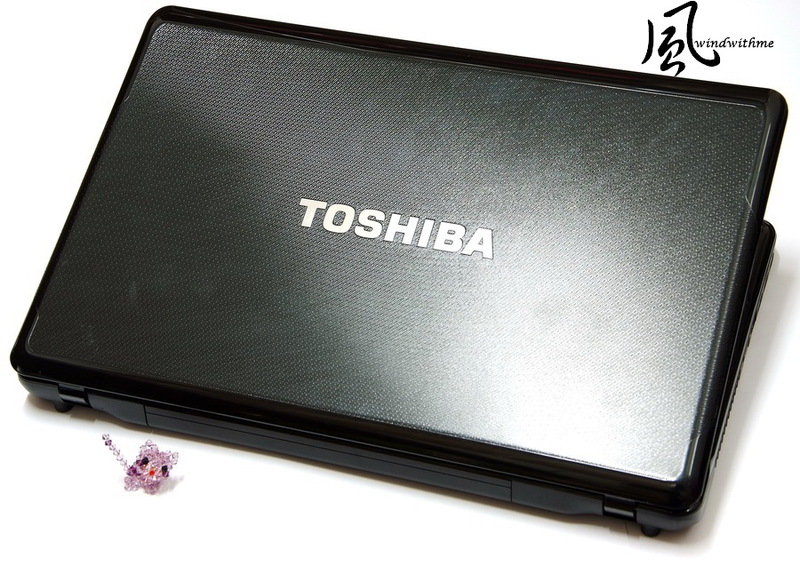 NoteBook platform use TOSHIBA 2nd generation Core i7. The chipset is Intel HM65. You can figure out this TOSHIBA NB quality just need to use for a while. Speaker quality is very good in my experience. 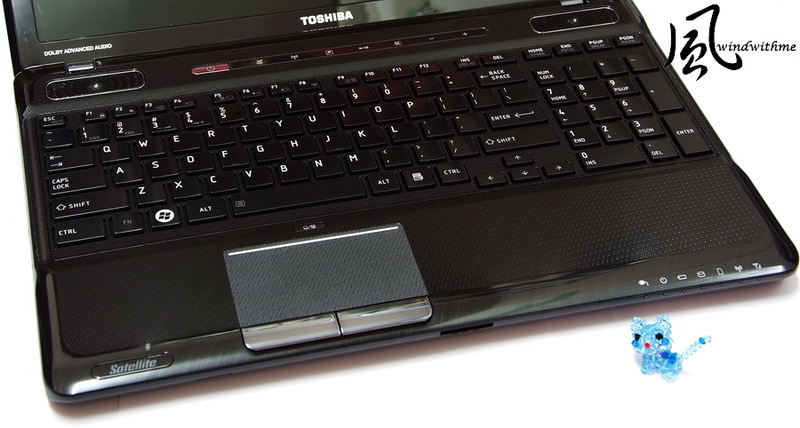 The Keyboard touch feeling and plastic copy hair line surface texture is very good as well. These 3 designs compare to my “Dual A” new NB are even better. The performance at NoteBook is still good. Some benchmark is same as PC, but the gap is not big. Personally, I think SSD has more advantage in NB than PC, because 2.5” HDD is slower than 3.5” HDD, also 2.5” HDD is more expensive. Even though SSD has no advantage at capacity, the difference with 2.5” HDD is smaller. It doesn’t mean SSD is not fit PC. Just consider about C/P value, it’s lower than NoteBook platform. 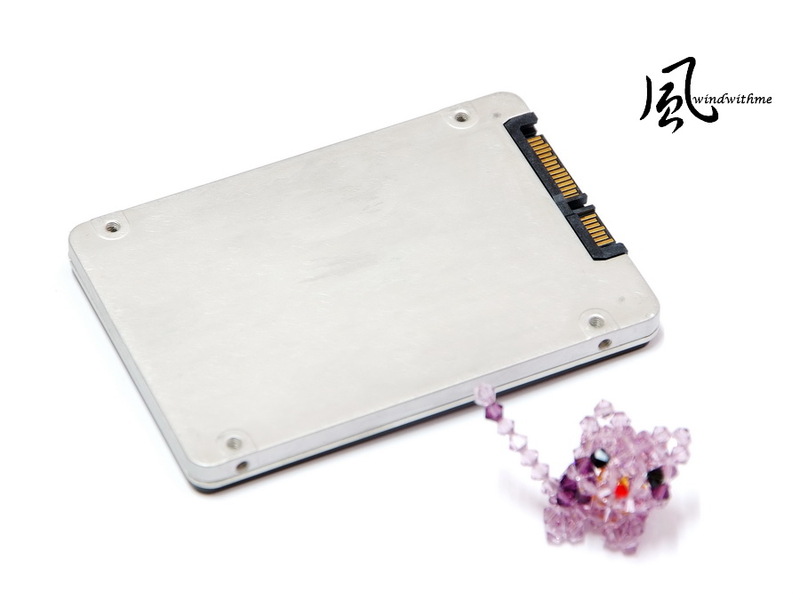 Small capacity SSD use for Z68 SRT hybrid acceleration technology with 2~3TB HDD is more suitable for PC platform. If in the future, the TRIM technology can use under RAID mode, the SSD advantage at PC platform will be more clear. Intel SSD is easy to find in the market. This time, these 2 series SSD price is higher than the other brands. 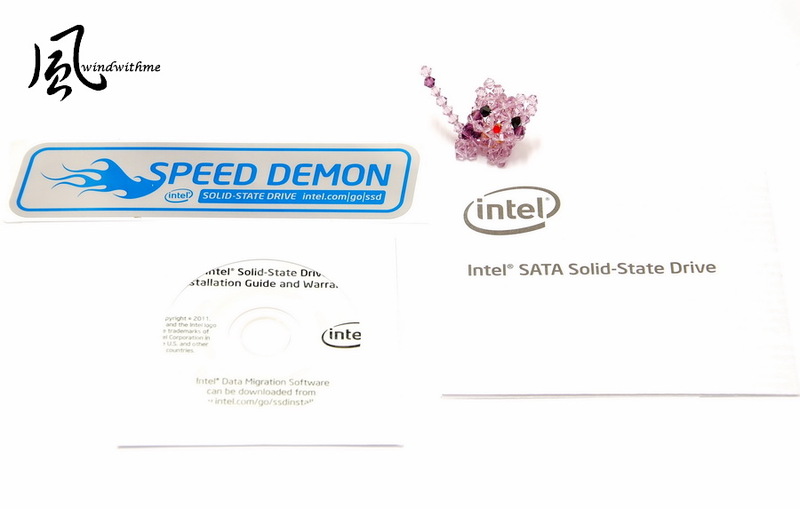 Due to Intel brand awareness and good after service, the SSD acceptance is still high. I hope 320/510 price can be lower in the future. It can enhance the completion force and market share. Currently, many read/write performance around 200 MB/s 128GB SSD price is 200USD. In same price position, SSD capacity increase to 128GB from 64GB in the past. It’s really helpful for execution. Of course, the unit price of SSD is still much higher than HDD. We do can look forward the lower unit price in the future. For most users, before buying 3C products, you need to study some basic information to avoid get unsatisfied products. Such as outlook, spec, after service, performance and executive features are all important.